First thing to go was the stock solid axle power steering box. This box has a steering shaft that extends out parallel to the axle with a pitman arm that rotates front to back (a.k.a. push-pull steering) and has a drag link that connects it to the steering arm (a.k.a. J-arm). 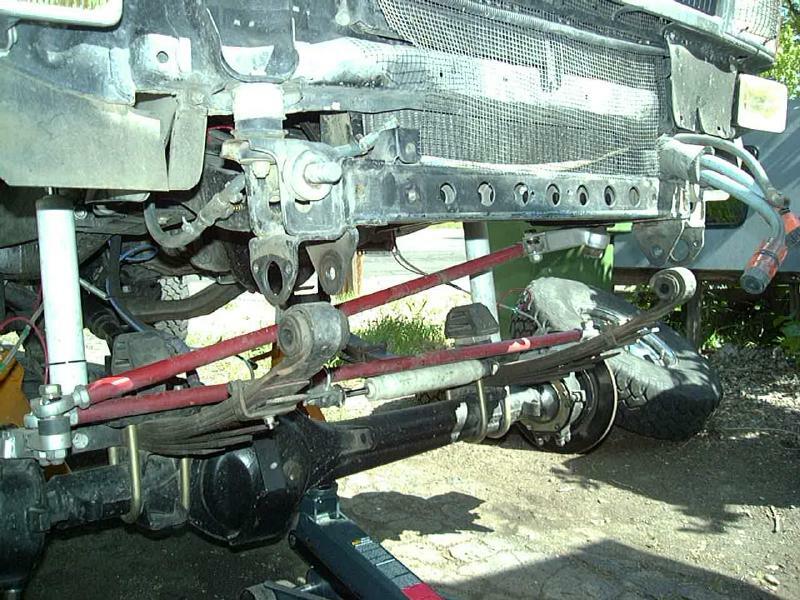 The crossover setup utilizes an IFS power steering box, where the steering shaft is orented vertically and the pitman arm stings side to side, i.e. 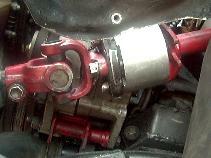 crossover steering. In the image above, you can see how the box is installed to the outside of the frame. It is important that it be pushed as far forward and as high on the frame as possible. This insures maximum clearance. In the photo, the tape measure end is attached to the back side of the body mount bracket. The forward bolt is approx. 4" behind this bracket. 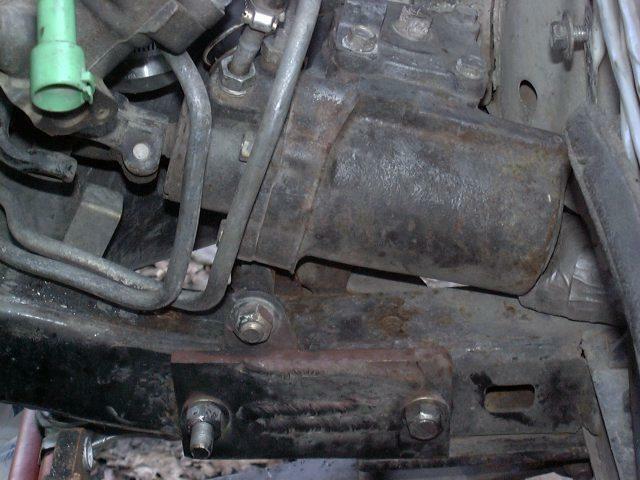 If the steering box is located too far back on the frame, the draglink and tie rod may hit each other under compression. So with a freshly rebuilt axle, it was time to do some wheeling. One of the first trips was to the world famous Rubicon trail. First day we went down the slabs from Loon Lake, through the alligator pit and pinch rock and in one place I got hung up trying to squeeze between a couple of big rocks. As I tried to push through, I heard my fan hitting the shroud, getting louder the harder I tried to turn the steering wheel. After passing that obstacle, we soon came to Walker Hill. I noticed my steering felt a little sloppy and by the time we crested the top of the hill, I knew something was wrong. I pulled over and saw the sleeves for the steering box mounts had pulled loose from the inside of the frame and a huge gaping hole remained around one of them. The only thing holding the box in place was the top bolt/bracket and the one remaining bolt was twisting at the head. I quickly scrounged up an old spring shackle plate out of my parts box, and re-inserted the torn-loose bolt through the plate and cranked it down good and tight. The field repair held for the rest of the trip, including my first trip through the Little Sluice and the spectacular drop into the Big Sluice. After getting home, I surveyed the damage and it didn't look to good. I found a piece of 3/8" plate that was just long enough to span the two lower bolt holes, drilled it to match. Before installing it, I decided I should do something to reinforce the damaged inner frame rail. I used up about a half dozen welding rods filling in the huge gaping hole in order to support the sleeve and give the backing plate something to rest against. Then after bolting up the plate, I welded it to the frame along the bottom edge, and purposely not welding the ends to the frame to avoid creating a stress point at the joint. Silence is golden, no more squeaking, no more slop in the steering. 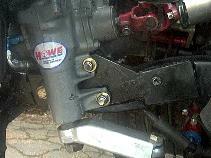 I would highly recommend anyone installing an IFS power steering box on a solid axle truck install a similar plate. Sleeves alone won't stand up to hard wheeling. 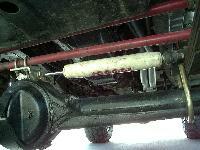 The extension did the trick, steering shaft is nice and tight and no need to make any permanent modifications to it. This part is available here in 1" and 2" versions. I arrived first thing Monday morning and by noon, the stock steering box, torque rod and bracket were removed and mounting holes for the IFS steering box were drilled. Later, sleeves were added to the lower two holes through the frame and a bracket for the upper mount were all welded in place. The stock steering arms were removed, the driver's side (J-arm) was modified by cutting off the drag-link end and a pre-fabricated double arm was used on the passenger side. 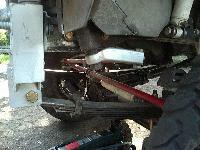 A Marlink heavy duty tie rod was installed in place of the stock tie rod and a used IFS power steering box was installed. After hooking up all the parts and doing a quick alignment, I was on the road by the end of the day. A week of wheeling was in store in the Southern California desert. I met Terry Johnson and Randy Burleson and we headed east from the AllPro shop in Hemet, CA. to start our adventure. Unfortunately, Randy had to return to work to handle some urgent problems, so Terry and I headed off to Joshua Tree NP, Johnson Valley and finally Santiago Canyon. The steering worked great for the trip and even without a steering stabilizer, it was rock solid and it handled like a sports car (albeit one on 33" mud tires and 4" of lift). Next trip was to Panamint and Death Valleys a month later. I started hearing a creaking sound from the front end. Upon returning home I found the nut holding the pitman arm to the steering box was a bit loose, so torqued it and the other bolts down. This seemed to quiet the strange noise for a while, anyway. It would return, and I'd torque the fasteners, until about 5 months later, no amount of torquing would silence the noise. 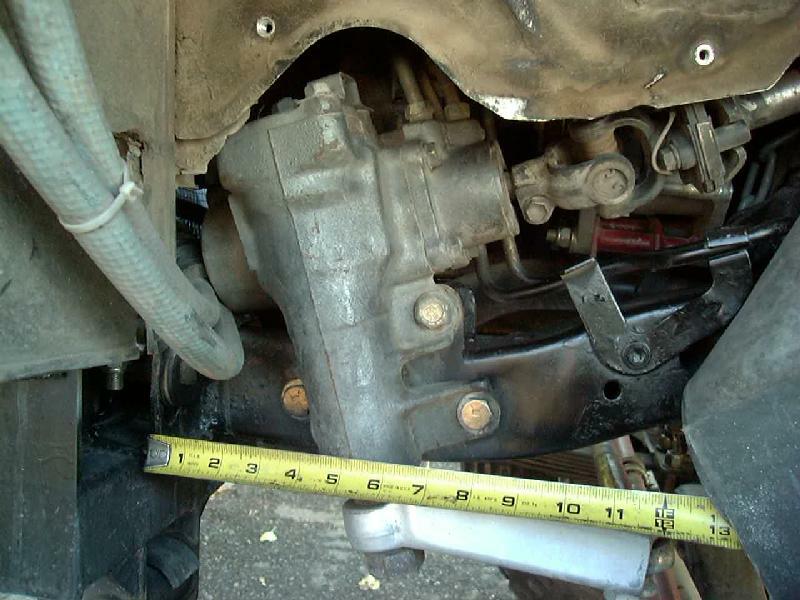 I figured it might be the steering knuckles making noise and a leaking axle oil seal (and a coat of gear oil covering the side of my 4Runner) prompted me to rebuild the front axle. 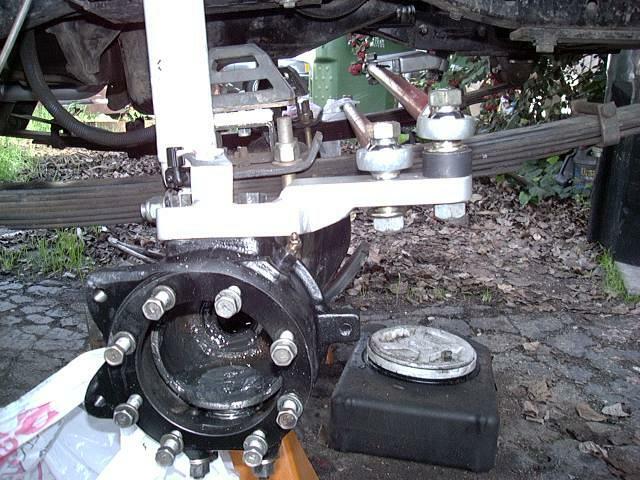 So, I'm all set with my crossover steering, all the kinks are ironed out, why mess with a good thing? One day, I stumbled upon a deal too good to pass up, a used HySteer crossover kit. So, I snapped it up in an instant. Actually, at the same time, I was toying with the idea of swapping my front differential over to an FJ-80 high-pinion unit, which would raise the front drive shaft about 4". 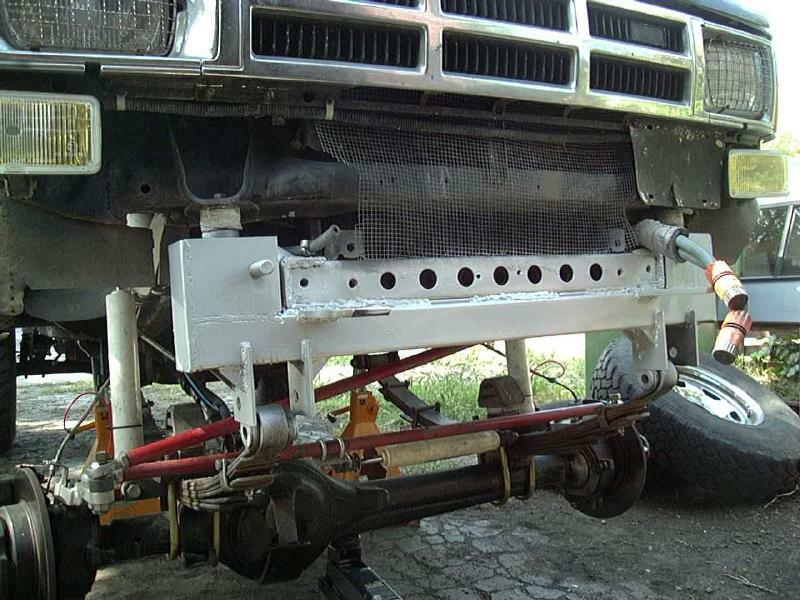 This would get the back of the axle more clearance, but what about the front? 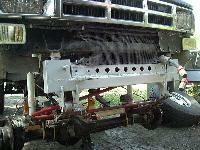 So, that's where the HySteer comes into the picture. 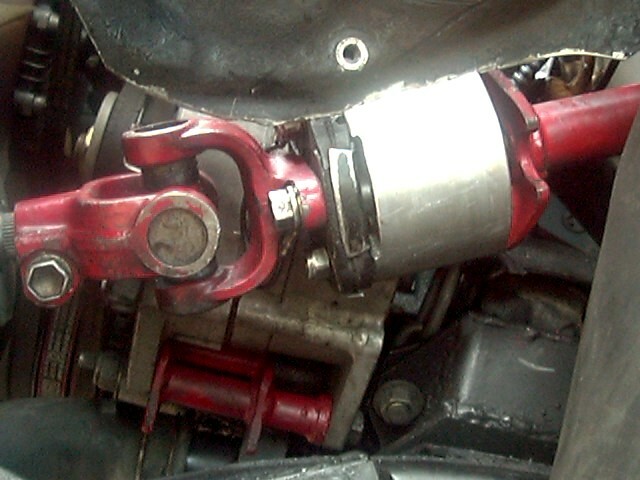 I fabricated a bracket from some 1/4" steel bar, drilling a hole to accommodate the stabilizer bushing, then welded that to the top-mounted u-bolt plate on the driver's side. 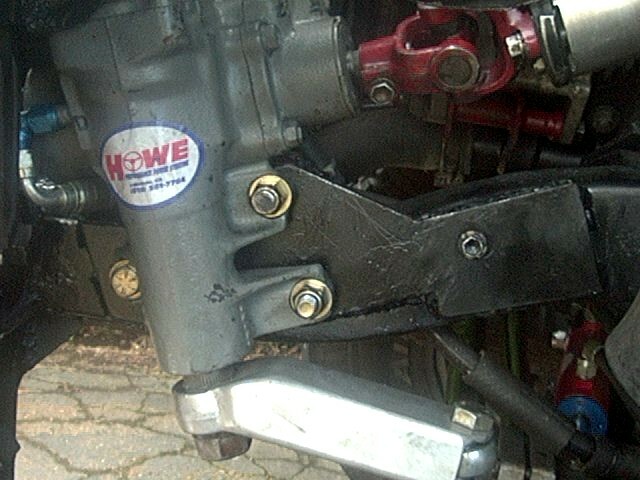 Then, I attached a right-angle bracket with small u-bolts to the tie rod about in-line with the differential housing. I set the length to avoid hitting during steering motions. 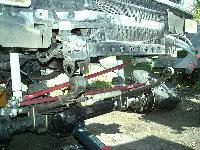 I found the tie rod moves approx. 6.5" lock to lock and the Heckethorn stabilizer I'm running has about 8" of travel. I had previously trimmed one end of the mounting stud down and it just barely clears the spring leaves behind the bracket. In a thousand miles of driving, both on and off road, its worked perfect, up and out of the way. David Moore had a nice bracket setup, too. I took the best aspects of the above two designs and modified them to suite my needs. Since my bumper is mounted directly to the frame (for added strength) I needed to allow for it to be re-mounted after dropping the springs. Like Jay, my weapon of choice was 2-1/2" x 0.125 wall square tubing. I used 3/16" x 4" flat stock for the rest of the assembly. The main tube was cut 3/8" shorter than the inside of the bumper mounting brackets (that I didn't use originally to mount the bumper) so that I could attach vertical brackets to remount the bumper higher if needed. I notched the tube 1" deep for the spring hanger plates. I also notched the other side of the tube to fit over my 3/8" bumper mounting brackets, which are bolted to the tow hook holes. I used 18mm bolts from my old Downey Rubicon spring shackles, instead of the stock hanger pins. 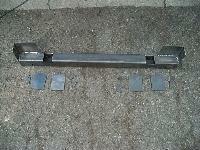 All parts were arc welded using 7018 rod. It makes a very nice looking bead and is very strong. I find it works best on DCEP. After cutting off the stock spring hangers (that's the point of no return!) 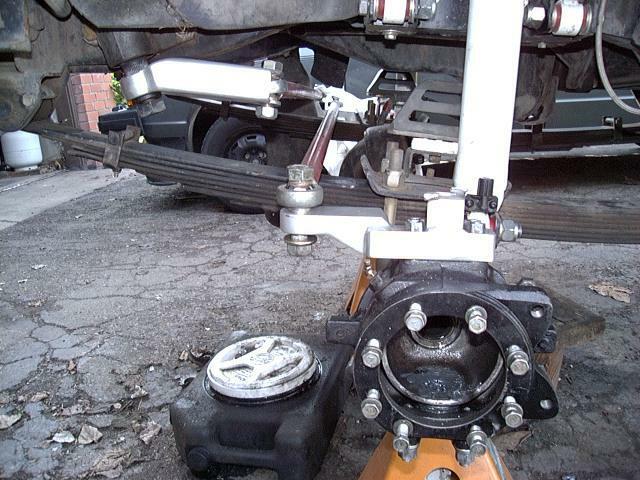 I clamped the bracket to the frame to check the fit and alignment. I found I needed to add a piece of 3/16" stock across the main cross member to fill in the gap where the side rails meet it. 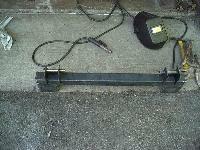 I used a full-width piece, 4" wide, and then welded it to to stock cross member as well as to my new cross member. 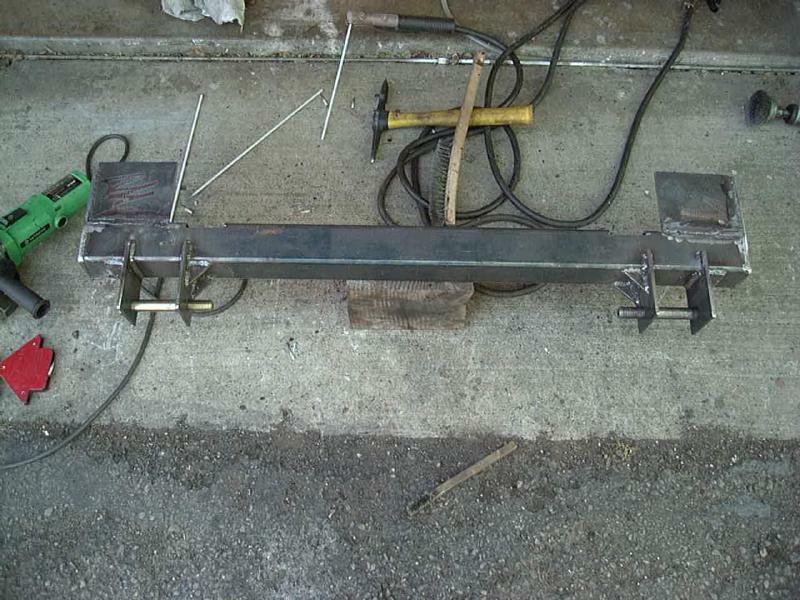 I also welded the new cross member to my bumper brackets and welded those brackets to the frame along their length. I also drilled holes for my old 3/4" bumper mounting bolts (which pass through the body mount brackets, to pass through to the bumper. 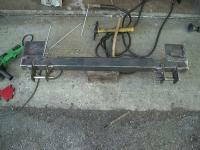 This will allow the bumper to clamp the new cross member in place, keeping everything nice and solid. So, what did all this work accomplish? Above, you can see the before and after shots, above. Before I had about 2" of clearance at the pitman arm and bump stop (bump stop set very high to keep the springs from hitting the pitman arm). 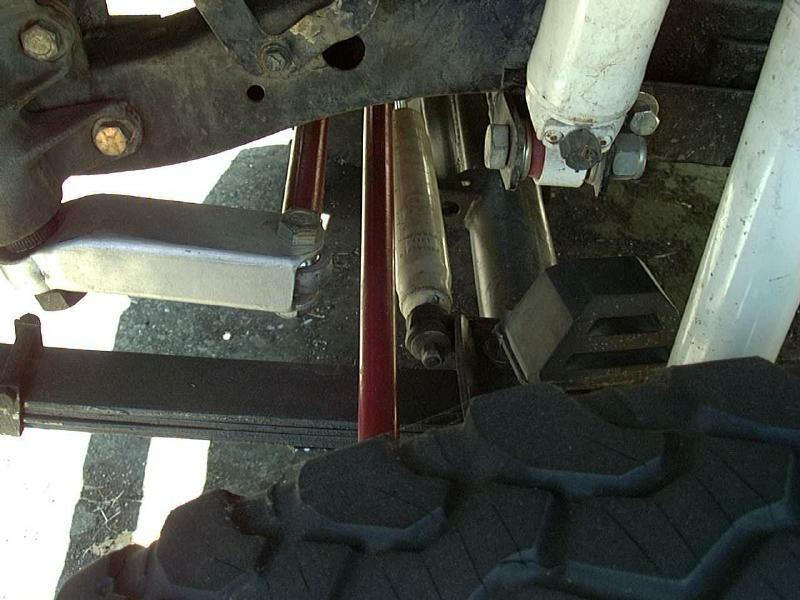 Afterwards, I have over 4" at the pitman arm, and since the whole spring/axle assembly is tipped down, I can drop my bump stops substantially to allow for more travel. Once I get the bumper re-attached, and do some fine tuning on my long travel shock setup and brake lines, I'll be ready to give this thing a real test. This modification (along with the use of stock rear springs) pushes the axle forward nearly 2-3/4" from stock, which is about the limit of the AllPro crossover steering, as pictured above. 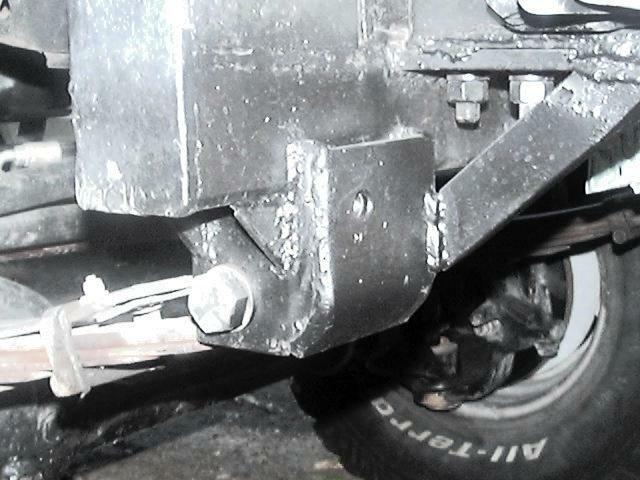 At full droop, the drag link sits directly above the tie rod, but moves back to clear it by about an inch at full compression. My front tires should now be well away from the inner wheel well, making room for 35's in the future. My long travel front shocks were designed with this modification in mind and they easily accommodate both the relocated axle and the additional travel. In fact, I may finally be able to go with the Rancho 9012's that I originally designed the system around (that will then give me nearly 19" of vertical shock travel, I think I can use at least 16" of that). After a few trips, it was evident that the exposed hangers sticking out front were rock magnets. I kept having to straighten out the bent ends and decided to finally address that issue. I bent up a length of 1/4" steel plate to wrap around the front of the hanger and welded it in place. 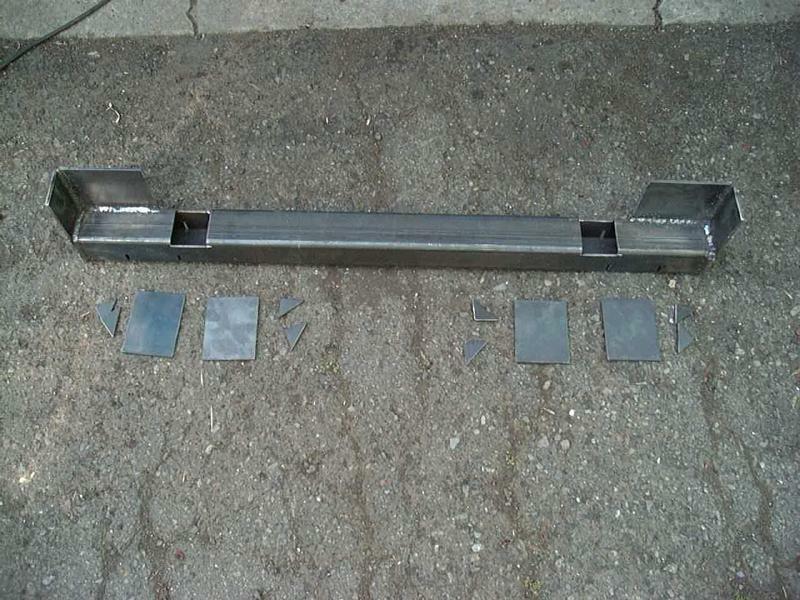 I also used this plate as an attachment point for my tow bar, so a pair of 1/2" heavy nuts were welded to the inside of each plate. After a recent trip over the Dusy/Ershim trail, the boxed in hangers really did their job, lots of rock dust and scrapes, but no damage.